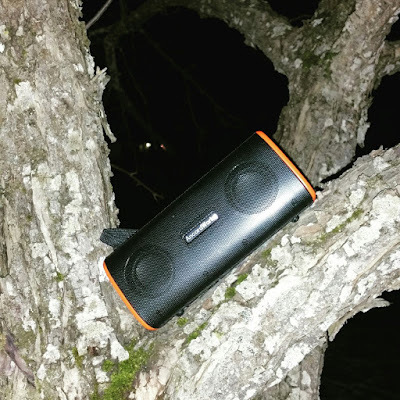 Being Frugal and Making It Work: Rock Out Anywhere, Anytime With a Great Portable Bluetooth Speaker! Rock Out Anywhere, Anytime With a Great Portable Bluetooth Speaker! Does your family spend a lot of time outside? Does your family enjoy listening to music? If you answered yes... you are sure to love this portable bluetooth speaker that is also waterproof & dustproof! Making it the perfect speaker for camping, boating, yard games, the beach, and more. What makes this bluetooth speaker so great? This Bluetooth speaker is perfect for you, your family, or your children... no matter where you are or where you go! It is perfect for travel & daily outings. It easily fits into your backpack or luggage. Plus, it's built-in rechargeable battery and microphone allows you to answer your incoming phone calls hands-free. My kids love taking their portable speaker bike riding and camping. They also enjoy using it when they are playing baseball or jumping on the trampoline in the yard! It's also great for sleep-overs. This portable speaker can be used anytime, both indoors and outdoors. It provides great sound, long battery life and is super durable! Where would you use a portable bluetooth speaker? *I received this item at a highly discounted price through Tomoson in exchange for my honest opinion. Thanks a lot for sharing such an informative post about the portable bluetooth speakers. No doubt! I am so much impressed by your blog. keep posting such kind of information on your page. I will certainly dig it and personally suggest to my friends. I’m sure they’ll be benefited from this website.